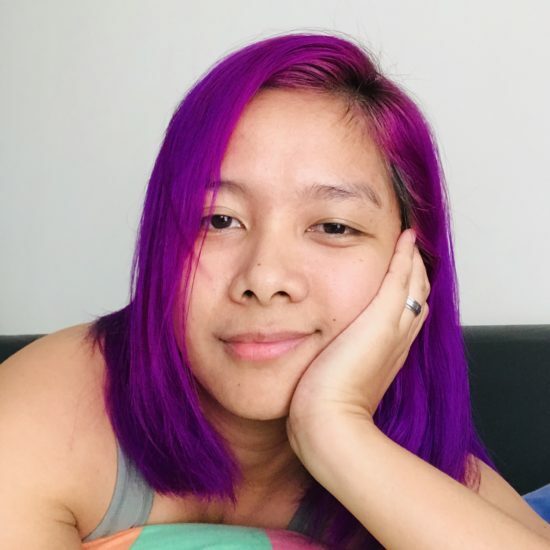 Laments of a Free Person | Where Have You Been Lately? My heart beats faster than normal. I am filled with sadness and hatred as I write this. It has been a year since we set foot in Phnom Penh but I can still completely recall what we witnessed there. Never in my life had I been in a place so solemn yet tragic. Choeung Ek Genocidal Center notoriously known as The Killing Fields did it for me. Upon arriving in the genocidal center, me and Rowjie were given a map of the field and an audio player with a recorded script in which we should listen to and would serve as our tour guide. I turned on the player and the voice of a man started speaking; it gave me goosebumps. Hello, my name is Ros Kosal. I was born in Phnom Penh, and I am Cambodian. Every one of us suffered, in one way or another, after what happened in our beautiful country on 17th April, 1975. As I continued listening to the recorded audio, I broke down and cried. I couldn’t bear what he was saying; it’s too cruel and painful for me. Cambodian killing Cambodians. I am a Filipino but I could feel the agony from the narrator’s voice. Do you see that big tree nearby? It is called the Killing Tree. Soldiers grabbed babies by their legs, smashed their heads against it, then tossed them into the pit. The people who discovered this place found blood, brain and fragments of bone on the bark of the tree. 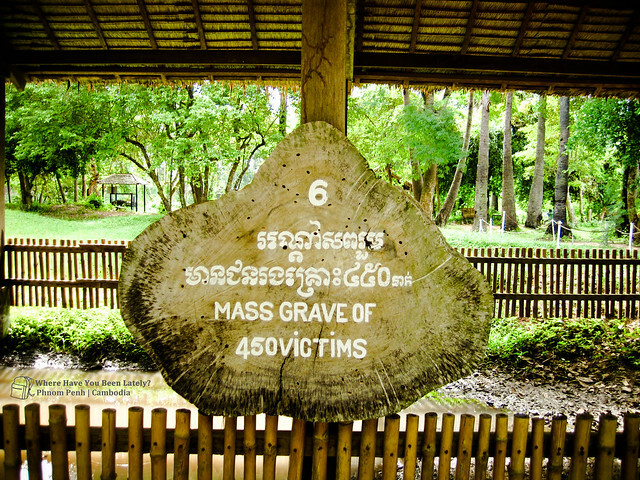 Approximately three million were brutally murdered out of the eight million population of Cambodia during 1975 – 1979. Pol Pot, leader of the communist government Khmer Rouge, wanted a New Society, a society that shows equality among the rich and the poor. Peasants with little education were his champions. Teachers, lawyers, and other professionals were threat and therefore enemies of his state. All 450 victims were fit into this small grave. Choeung Ek was a silent witness to all the atrocities that the Khmer Rouge committed. 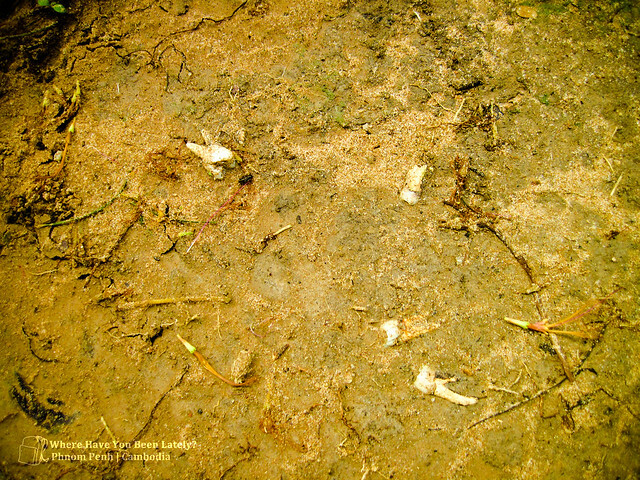 Though only the bones, teeth, and clothes of the victims that come to the surface when the soil is eroded are the only visible proof of it , the surrounding still gives you a view of what happened during the Pol Pot regime as if it was just yesterday. What’s more tragic was that Pol Pot, who ordered the killings of all those who might oppose him wasn’t given the punishment he well deserved, died when he was 82 years old when he didn’t even let 8-month-old babies live. Bones and teeth of the victims. Depressing as it may be, I suggest everyone planning to visit Cambodia to not just be amazed by the wonderful temples in Siem Reap but also pay respects to those innocent who perished due to a belief that was poorly executed by brutal men. Please visit Phnom Penh and its Killing Fields. It’s a great reminder of how grateful we should be because of our freedom that we don’t have to experience what the eight million Cambodians underwent. Phnom Penh is healing. The scars that the wounds of genocide left are deep but they also pave way to the betterment and unity of Cambodia. The memorial stupa for the victims. I am from a democratic country where everyone is given so much freedom to do whatever they think is right. My heart laments because of the freedom we enjoy most while others don’t even know its meaning. Me and my brother skipped this as we already felt heavily by our visit to Tuol Sleng Genocide Museum. I could not imagine how it is to live during the Khmer Rouge’s regime, we’re still blessed that even though we had our own dark days during the 70’s, it wasn’t anywhere close to what the Cambodians went through. We first went to Choeung Ek. So when we arrived in Tuol Sleng, we just wanted to get it done and over with. Very painful period of Cambodia’s history. I hope we all learn from it. This was probably the hardest tour/place we visited on vacation. What occurred here was probably one of the most horrendous things ever happened to humanity, so going through it and hearing about the stories/places is difficult. The most memorable thing was probably the killing tree and what it was used for. The tour was an audio tour. 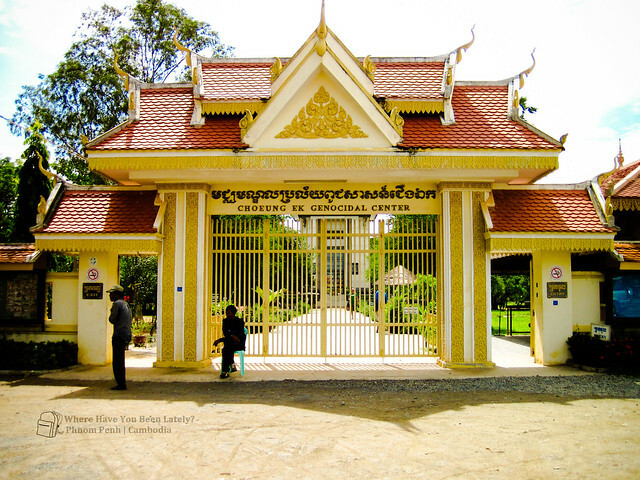 The tour took you through areas of significances and provided stories of people that survived the Khmer Rouge Regime. It ends in this monument where they have the skulls that they found there. It’s a beautiful monument, but very depressing to see the skulls. Either way, everyone should come here. However, be prepared to cry. I did. Hi Susanna! You have a heart of stone if you don’t cry in Choeung Ek. Thanks for dropping by. i can’t help but be visual about the babies being smashed into the killing tree. how could they do such a thing 🙁 i dunno if i cud come there, i might cry a river. Hello Sir Oman. Though I knew what to expect when visiting the place because of the blogs I’ve read, I wasn’t exactly prepared to get so emotional. I did cry, yes. 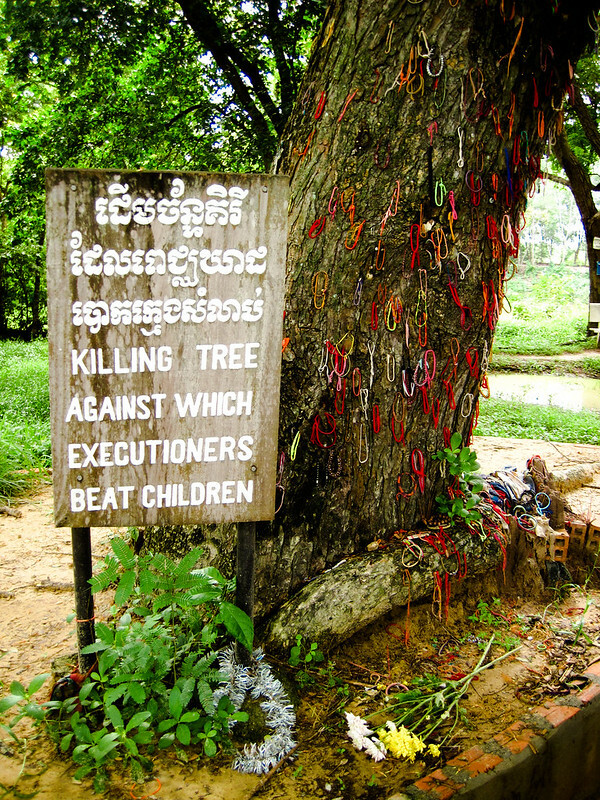 The purpose of the Killing Tree was just horrible.